Ammonites have intrigued mankind for thousands of years. This fossil has created enough interest to inspire dozens of stories, legends and myths. The name comes from its appearance: it resembles a ram’s horn. In Egyptian mythology, the God Ammon looked like a man with horns like a ram. The ancient fossil was considered Ammon’s stone, thus inheriting the name, ammonite. Ammonites belong to the class of animals called mollusks. More specifically they are cephalopods. and first appeared in the lower Devonian Period. It is thought by some that they evolved from the older nautiloids. The cephalopods were an abundant and diverse group during the Paleozoic Era. Cephalopods are present in today's oceans as squid, octopus, cuttlefish, and nautiloids. While they are still a diverse group with about 800 species, it is estimated that there are about 17,000 extinct species. Their hard shells were easily fossilized and so we have an abundant supply of these fossils to learn from. The shells had many chambers divided by walls called septa. The chambers are connected by a tube called a siphuncle. The septa are the walls that devide the chambers within the shell. Nautiloids had simple septa with a single arc. The ammonites developed septa that had intricate folds called lobes and saddles. They also developed delicate lacey patterns on the outer shell. There are three basic patterns for ammonite septa. The pattern of the septa can be reflected on the outside of the shell. These are called sutures. These patterns along with the shape of the shell and the structure of the septa are how this cephalopod is classified. The goniatites are older ranging from the mid Devonian Period to the end of the Permian Period. They are easily recognized by the zigzag suture patterns. Goniatites are fairly common in Devonian age fossil beds in Morocco. You can see examples of these goniatites here. While little is known for sure about the lifestyle of these extinct mollusks, we can make some educated guesses. Since all living cephalopods are predators we can assume that ammonites were as well. The only living cephalopod with an external shell is the chambered nautilus. It can swim and control its depth. It does this by using the siphuncle. The siphuncle is a tube that connects all the chambers in the shell with the living animal. The nautilus can add or subtract gas in these chambers to control buoyancy. It can also jet propel itself by squirting water out of a funnel like organ. Ammonites have a wide range of size. Specimens have been found ranging from less than a centimeter to 2 meters in diameter. 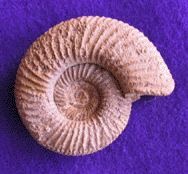 Early ammonites, until the middle Jurassic, were smaller, usually less than 9 inches or 23 centimeters. During the upper Jurassic and lower Cretaceous larger varieties can be found. Titanites found in the south of England can be over 50 centimeters, 2 feet in diameter. Female shells of ammonites, like their modern counterpart, the nautilus, tends to be larger than the males. The hard shell of the ammonite was easily fossilized. This, combined with the sheer abundance of the species and its evolutionary duration through several geologic periods, make it a good index fossil. Index fossils help paleontologists and geologists to determine the age of rock layers. This is called biostratigraphy. It works like this. If you find an ammonite from a genus known to be from the Triassic Period, then the rock layer it came from must be Triassic. 1. It must have wide distribution. 2. There must be a lot of them. 3. It must belong to a group that evolves rapidly. 4. They must be easy to recognize. The ammonites as a class survived several mass extinctions during their long tenure among the living. However the end of the Cretaceous Period was also the end for this class of cephalopods. It is believed that a huge meteor collided with earth about 65 million years ago. This event caused a tremendous amount of dust to be thrown into the atmosphere, blocking out the sun for years. Rapid climatic changes were the result. It has been estimated that 80% of the earth’s inhabitants, including all of the dinosaurs, became extinct during this event. Are you looking to buy ammonite fossils? 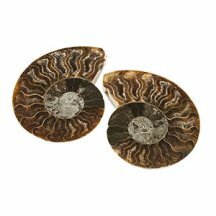 Fossilicious.com has a wide selection of ammonites to add to your collection or classroom.